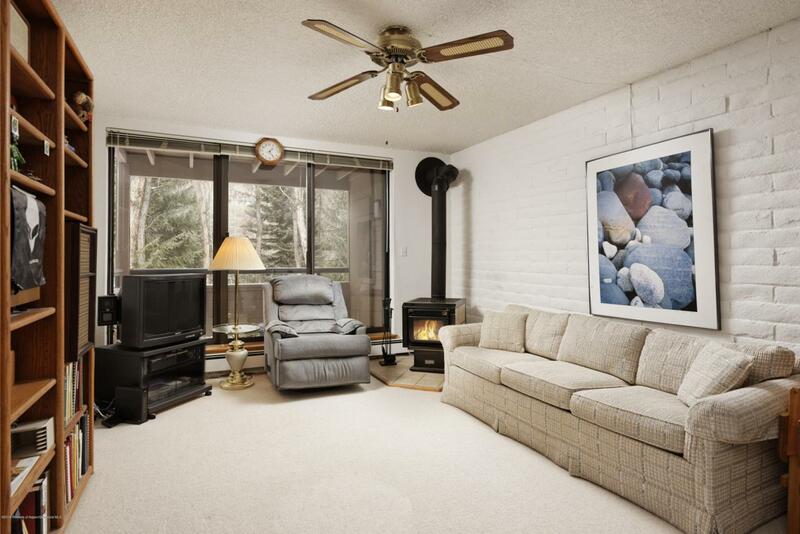 224 Vine Street, Aspen, CO 81611 (MLS #157534) :: McKinley Real Estate Sales, Inc.
Quiet, serene setting overlooking the woods and river of the Hunter Creek valley dominate your large plate glass window and slider. Deer commonly stroll by. This is a one bedroom unit in excellent condition, with built-in closets for your convenience. Never remodeled before, one can live in as is, or remodel the unit to your taste. Wood stove and private deck with storage closet are included. This condo is located in Building 2, where construction allows quiet from the cement floors and ceiling, along with brick walls. Lots of amenities at this complex including pool, jacuzzi, tennis courts, spacious grounds, and built-in BBQ's. Conveniently located with bus service to Ajax every 20 minutes, or walk 7 minutes to the core. This is value and affordability at its best!